Obras para Piano de J.S. Bach (II). 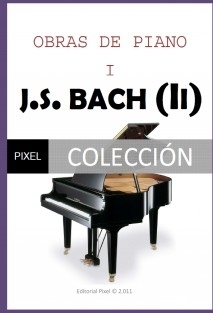 Tomo II de II de las Obras para Piano de Johann Sebastian Bach. Obras para Piano de J.S. Bach. Volume II of II of the Works for Piano by Johann Sebastian Bach. J.S. Bach Piano Works. Volume II von II der Werke für Klavier von Johann Sebastian Bach. J. S. Works for Piano Bach.